The first “Google phone” is rumored to be introduced into the market early next week. 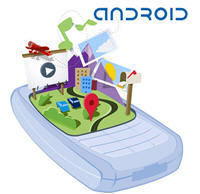 An article in the Wall Street Journal on thursday announced Google’s plans for their first Android based phone. It is the first commercially available phone to run Google’s Android operating system since the announcement of the project in November of 2007, almost a year ago. The phone is said to be priced at $199 to directly compete with the iPhone 3G. Service and data is rumored to be through T-Mobile USA. At this price point the hopes are to make it more appealing to those considering the iPhone. The phone is said to be released on September 23.